This year it is 30 years since the 1984 miners’ strike, which opposed the government’s policy of pit closures. 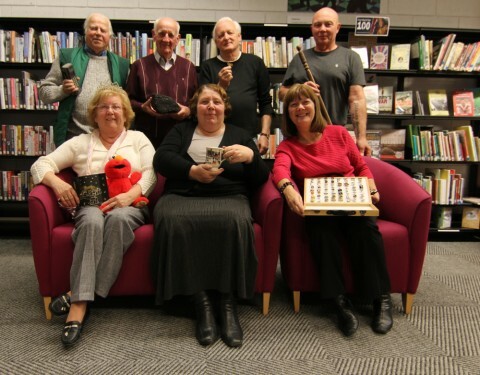 Neil Winterburn and Internet of Things expert Adrian McEwen worked with the ex-mining community in St.Helens to create an interactive exhibition of enchanted objects, telling the story of the past 30 years. The project was commissioned by St. Helens Arts Service as part of the second Cultural Hubs programme and is supported by public funding from the Arts Council of England. Throughout a series of creative workshops we asked the men and women of the ex-mining community in St. Helens to share and curate a selection of objects to describe their experience of the past 30 Years. We used these objects as a focal point to discuss the strike, to evoke memories and to explore how things have changed over the years. The project culminated in a screening of the film ‘Still The Enemy Within’ and an exhibition of enchanted artefacts. Cabinets of interactive artefacts were displayed at Chester Lane and Haydock library, with viewers able to investigate the objects using a specially designed sensor, that triggered audio descriptions of the memories that they sparked. The exhibition also featured smart objects that responded when they were being talked about on Twitter. Still the Enemy Within screening Flickr photoset.